Quick Post: I was so sad when I finished this…I love grilled corn, but this made it extra special. I will make this again, and make sure that I buy extra ears for us. Thanks for reading, enjoy! 1. In a small bowl, whisk together 1/4 pound of the butter, chili powder, cayenne pepper, lime zest, and lime juice until thoroughly combined. Set aside. 2. Lightly butter the corn with the remaining butter and season with salt and pepper to taste. Wrap ears individually in aluminum foil. 3. Light one chimney full of charcoal. When all the charcoal is lit and covered with gray ash, pour out and spread the coals evenly over the charcoal grate. Clean and oil the grilling grate. Place the foiled corn on the grill and cook until tender and slightly charred, about 20 minutes, turning 4 times during cooking. Remove from the grill and let cool for 3 to 5 minutes. 4. 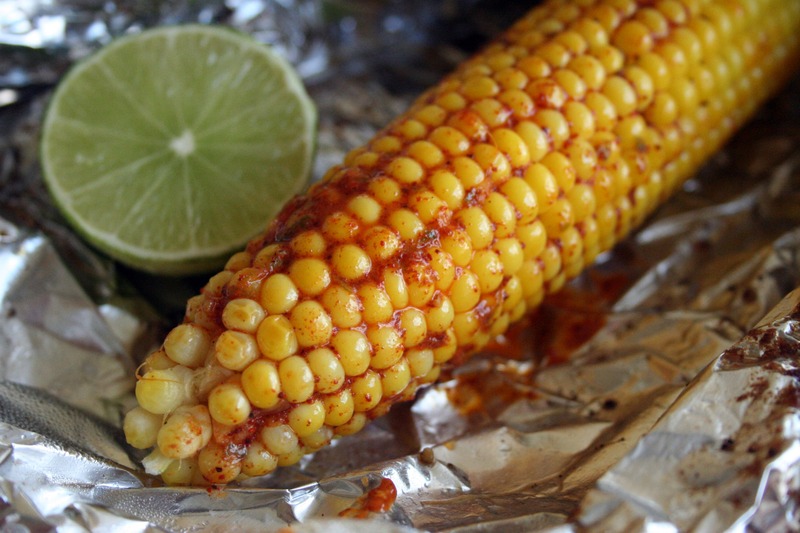 Open the foil, slather each ear in the chili-lime butter, and serve with the lime wedges.